MySpace, in an all out war with Facebook over this year’s prize (socializing the web), is relaunching their Data Availability product today under a new name and announcing some snazzy new partners. Goodbye, Data Availability. Hello MySpaceID . Along with the renaming ceremony, MySpace is also announcing two new partners: Netvibes and Vodafone (the latter is an interesting mobile play for MySpace). 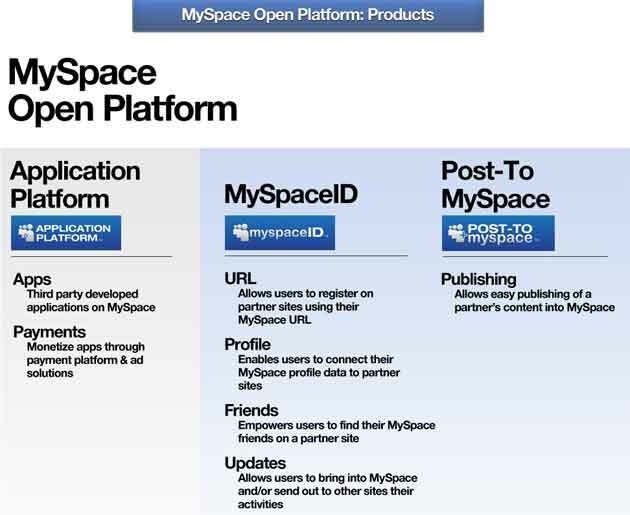 MySpaceID is roughly analogous to Facebook Connect, which had their own coming out party last week. Sites can add various elements of MySpace ID to allow their users to log in via their MySpace credentials, display their profile information, and find MySpace friends who are using those sites. Starting early next year, MySpace says, they will add the other features that Facebook Connect has now, such as publishing activities from partner sites to MySpace, and syndicating MySpace activities to partner sites. MySpace will also allow partner sites to take new user registrations beginning with their MySpace credentials and basic profile information. 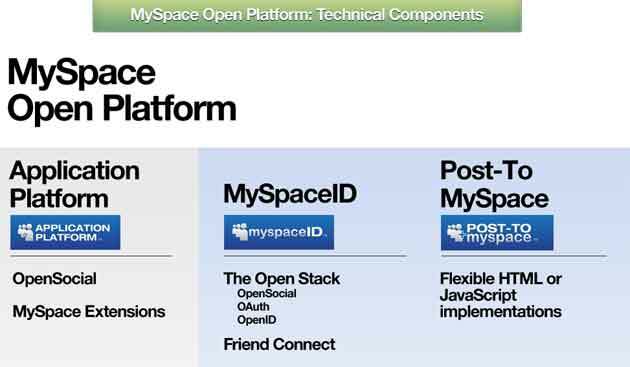 The crucial difference between MySpaceID and Facebook Connect is the software stack. Facebook uses proprietary software and methods, although they say they will open up over time. 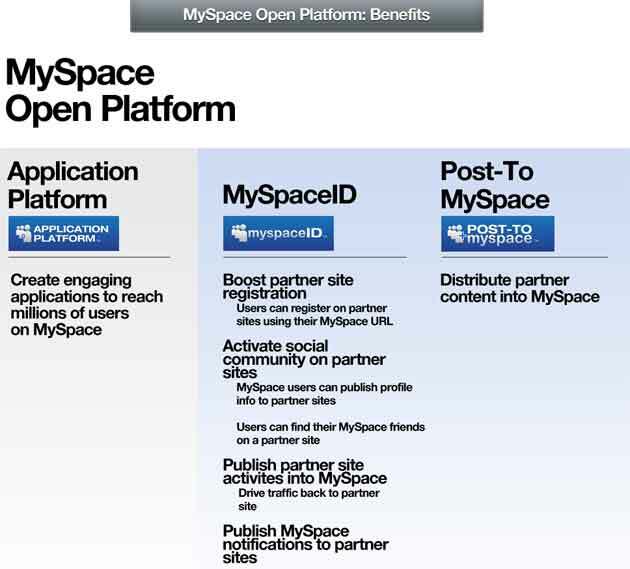 MySpace has embraced open standards across the board, including OpenID, OAuth and Open Social. The benefit, they say, is that sites will be able to implement other competing services that are also on the open stack with few implementation changes. Yahoo, for one, is rumored to be taking a similar approach. MySpace also plays nicely with Google Friend Connect, allowing users to log in to sites that have implemented Friend Connect with their MySpace ID. Facebook stubbornly refuses to play ball with Google – they seem to want that direct software connection with partner sites. It’s clear that small sites are eating this stuff up (hey, we launched Facebook Connect the first chance we could). But the larger guys are taking their time. MySpace’s original launch partners – Twitter, eBay and Yahoo – are yet to implement it. And few of Facebook’s original launch partners have shipped the service, either (Digg is rumored to be waiting until at least the middle of next year). But one key feature of both products – the ability to tell MySpace or Facebook a user’s email address and get back all of their friends on those services – is likely to quicken the adoption rate by large partners. They want to fill out their social graph as quickly as possible and link up all those users as friends. Both of these services make that happen. Screen shots of the details of MySpaceID are below. I’ll be interviewing MySpace COO Amit Kapur on Tuesday morning in Paris at the Le Web conference as well, and MySpaceID will be one important area of the discussion.